I’m honored to be spending today with one of my favorite ladies, Victoria from vmac+cheese. Not only did she prepare an amazing dessert for our Valentine’s celebration, but today is a special one for Victoria… It’s her first day as a full-time, self-employed rockstar, with her new biz Vivaleur! I couldn’t be more excited for her… so let’s celebrate with some dessert! Hi everyone! Victoria from vmac+cheese here to share a fruit tart recipe I put together especially for Nikki and all of you. The best part about it? Well, other than being delicious, it’s easy to make (though it looks fancy) and you can also serve it pretty much any time of year, not just Valentine’s! 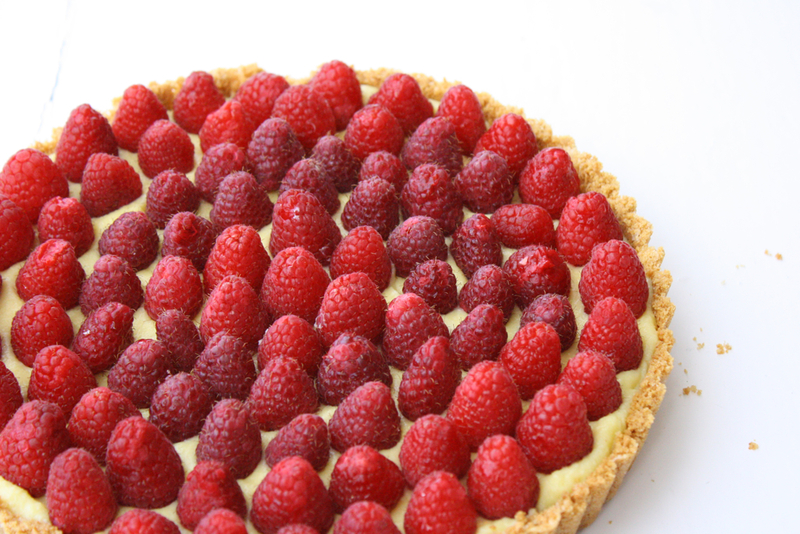 The crust in this pretty little tart is made with store bought graham crackers. A little homemade pastry cream (trust me, it’s simple! ), and a garnish of fresh fruit, and you have a dessert worthy of Valentine’s Day, or even just a regular brunch with friends. Give it a try! Preheat oven to 325 degrees. 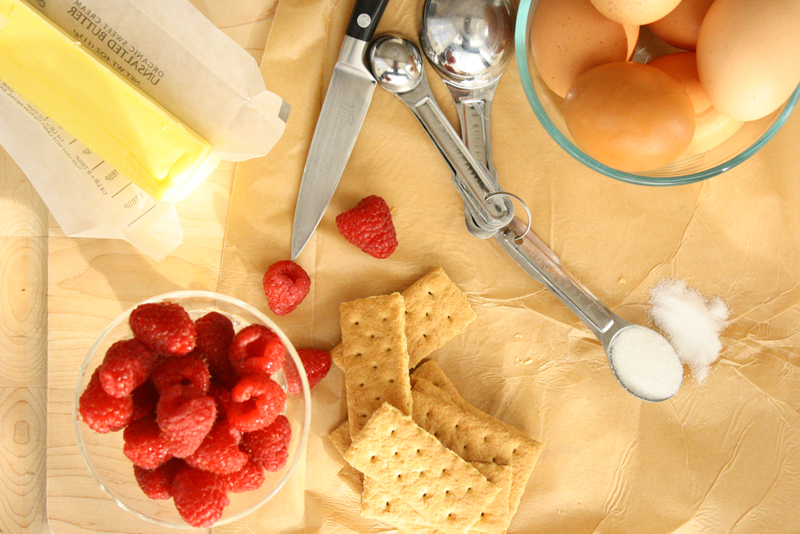 Break apart the graham crackers and add them to a food processor bowl. Grind until you have a fine meal. It should yield about 1 1/2 cups of graham cracker “flour.” In a medium bowl, combine the graham cracker flour, the sugar, and the butter. Toss together until combined and the graham cracker flour is moistened. Butter an 9″ tart pan, then set it on a sheet tray (this will just help you avoid a huge mess, and transfer the tart easily). Press the graham cracker mixture into the tart, and along the sides of the pan. I used the back of a measuring cup to press it and pack it in. Use a knife and run it along the top edge of the pan to sweep away any excess crumb (or you can leave it if you like a rustic looking tart). Bake for 10 minutes, or until the crust is fragrant and just set. It should feel firm to the touch, not crumbly like it was before baking. Combine the milk and half of the sugar in a sauce pan over medium heat. Stir gently to combine, and let it scald. While the milk is heating, beat together the yolks and the rest of the sugar in a glass or non-reactive bowl. I like to whip them by hand using a whisk, but you could use a stand mixer if you wanted. Beat them for several minutes, until the mixture is very pale yellow and aerated. Add in the flour, the pinch of salt, and beat again until well incorporated. It should be thick, almost like a paste. Stir in the extracts. Once the milk is hot, carefully pour in just a little bit into the yolk mixture, and immediately stir. You will want to move quickly, so the yolks don’t scramble. Once the first bit of milk is incorporated, add some more in, and stir again. This process is called tempering, and the whole idea behind it is we want the yolk mixture’s temperature to increase, but not so quickly that things scramble! Once you’ve added in about half the milk mixture, pour the egg/milk mixture back into the pot with the remaining milk, and set it over medium to medium low heat. Use a spatula to stir it, being sure to scrape the sides and bottom of the pan. After a few minutes, it should thicken considerably. Stir to ensure it doesn’t burn. If lumps form, you can beat them out with a whisk. Once it’s hot enough that bubbles start to gurgle up through the cream, cook it for 1-2 minutes more, until it’s very thick, like pudding. Remove it from the heat, and stir in the butter. Pour the pastry cream into a clean bowl, then cover it with plastic wrap. Be sure the plastic wrap directly touches the cream, so that a skin won’t form. Store in the refrigerator until cold. You could make this a day or two ahead. 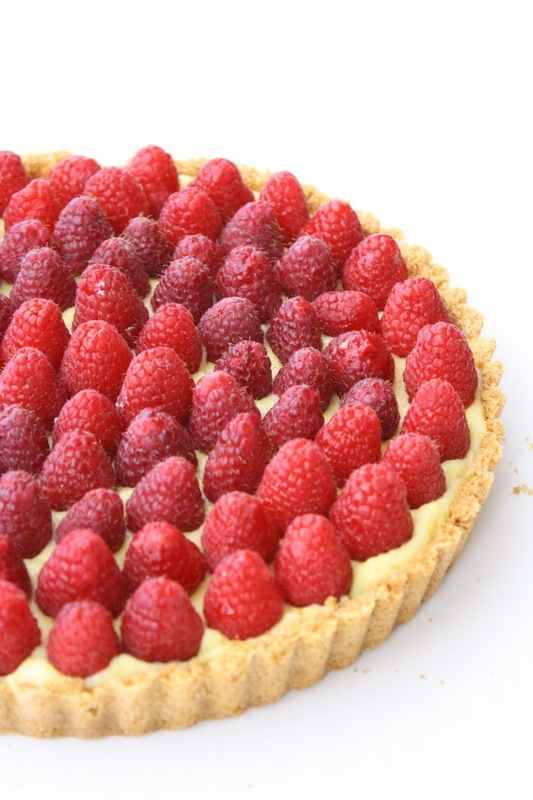 Spread the thickened pastry cream into the shell of the tart with a spoon. Garnish with fruit or whatever other items you’d like, then serve. OPTIONAL: To get that gorgeous, fresh from the bakery fruit tart look, mix apricot jam with a little water until it’s slightly liquified, then use a clean spray bottle to glaze the top of the tart. It’ll look shiny and super professional. Enjoy! 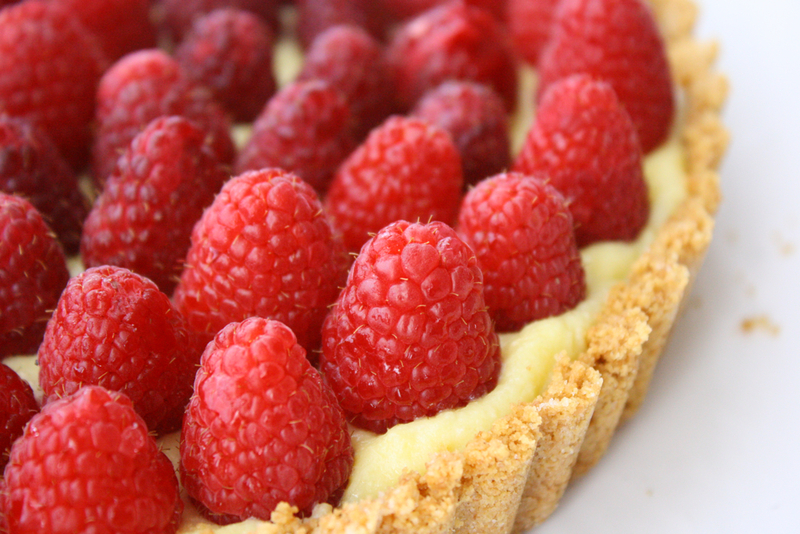 *The tart can be made a day in advance. Allowing the pastry cream to sit in the crust for at least several hours will help prevent the crust from crumbling when you serve it. If you refrigerate your pastry cream and find it’s not setting up (i.e., it’s still more liquid-y than pudding like), here’s a fix. Melt a couple tablespoons of butter and add in an equal amount of cornstarch. Whisk this together until it’s a paste, then whisk that into the pastry cream. Set it over medium heat, and stir constantly with a spatula or whisk, until you bring it to a slight boil again. It should be thick and spreadable. Refrigerate it again with contact plastic wrap, then use as you wish. Posted February 9, 2012 in Holiday by Nikki. Mmm. That looks delicious and so easy to make! Looks so delicious- I’m going to have to hunt now for something sweet, its made me hungry! So FYI your Valentine’s Day series has been THE.BEST – the site is looking so good! And I love every single guest post author you’ve hosted. I really want to do something special for Evan on V-day after this weekend and I feel like baking is the best way to start, right? This looks delicious and the photos are fantastic also! I seriously want to reach through the computer and test it out. Thanks for posting! SO fancy, Victoria!! Looks delicious! Thanks for having me today, Nikki! Hope everyone enjoys. Happy Valentine’s!